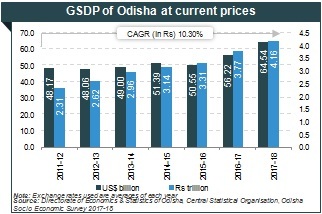 The state's economy witnessed high growth rates between 2011-12 and 2017-18, with Gross State Domestic Product (GSDP) expanding at a Compound Annual Growth Rate (CAGR) of 10.30 per cent. Odisha has emerged as a key state with regards to the mineral and metal based industries. At 34.3 per cent in 2018, Odisha contributed the largest share of mineral production India in terms of value. Value of minerals produced in the state reached US$ 3.12 billion in 2017-18. It is the first state in India to have undertaken reform and restructuring initiatives in the power sector. As of February 2019, the state had a total installed power generation capacity of 7,649.12 megawatt (MW). The state has attracted Foreign Direct Investment (FDI) inflows worth US$ 504 million during the period April 2000 to December 2018, according to data released by Department of Industrial Policy and Promotion (DIPP). Odisha has a well-developed social, physical and industrial infrastructure, and the state government has undertaken several infrastructural projects to further promote overall development. The state's infrastructure includes well-connected road and rail networks, airports, ports, power, and telecom. Total merchandise exports from Odisha were US$ 4.86 million in FY19 (up to December 2018). Odisha’s industries are based mainly on the natural resources available in the state. It carries more than 35 per cent of country’s natural resources. The state has significant reserves of iron ore, bauxite, nickel, coal, etc. Hence, it is an attractive destination for mineral-based industries. According to state budget 2018-19, proposed an outlay of Rs 114 crore (US$ 17.69 million) for the mining sector.